Sometimes called the silent killer, hypertension often shows no noticeable symptoms but is linked to a slew of potentially fatal conditions. By damaging the walls of arteries, veins and blood vessels in the heart, brain and organs, hypertension, or high blood pressure, can cause strokes, heart attacks, and aneurysms. Treating high blood pressure can prevent a wide array of damage to the eyes, kidneys, heart and brain. Between a third and a half of Americans have high blood pressure, and for some, it will be a perpetual ailment. 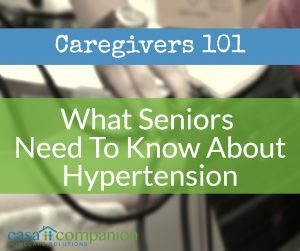 Caregivers, home care aides and loved ones should know the causes, signs and treatments of hypertension. Blood pressure is the force blood exerts against the walls of your arteries as it moves through your body. When the heart beats, it pushes blood through the arteries with its greatest strength. This is called systolic pressure. In between beats, the pressure drops because the heart is at rest. This is called the diastolic pressure. Your blood pressure is always measured by both these numbers, so your blood pressure reading will be the systolic pressure ‘over’ the diastolic pressure, as in ‘120 over 80’. Like many things we used to be able to count on, blood pressure changes as we age. A natural rise in blood pressure as patients become older is called essential, or primary, high blood pressure. There’s no single, identifiable cause, though research continues. When medication or another medical condition causes hypertension, that is called secondary high blood pressure. What Should Your Reading Be? The CDC estimates that a third of the country has HBP, but the American Heart Association says half of us do. Why the discrepancy? Until early 2017, a reading of 140/90 was considered high, and 180 over anything was an emergency. But last year two new sets of guidelines were published about blood pressure, and things got a little confused. The American College of Cardiology and the American Heart Association declared that a reading above 130/80 should be considered high blood pressure, and that this applied to every adult regardless of age. Boom! Nearly half of all adults have high blood pressure and should be treated accordingly to bring it down. But in March of 2017, the American College of Physicians and the American Academy of Family Physicians published a clinical guideline that doctors should target a systolic pressure of 140 or lower in those over 60 at high risk of stroke or cardiovascular event. And for everyone else over 60, a systolic pressure of 150 or lower would be just fine. So the definition of high blood pressure isn’t as black and white as it used to be, since age and the medical judgement of your doctor could determine if or how you’re treated for it. But if you’re over 60, everyone still agrees that a reading of 150/90 is something you should address right away. 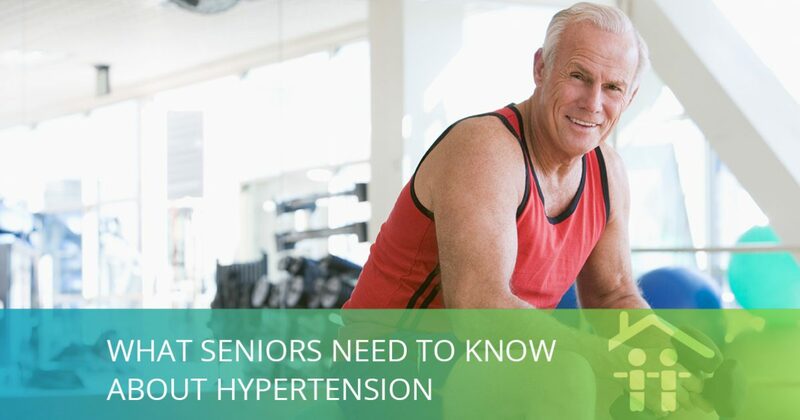 Next month in Part II of What Seniors Need To Know Now About Hypertension, we’ll discuss the risk factors, prevention strategies and treatments for high blood pressure.